I’m going to be honest with you: If I’d written this review even a week earlier, its score would’ve been lower. All because of a misunderstanding between me and the difficulty levels. Of course I want to start a game on its intended difficulty. Of course I want to play games “the way they’re meant to be played” per the developers’ suggestions. 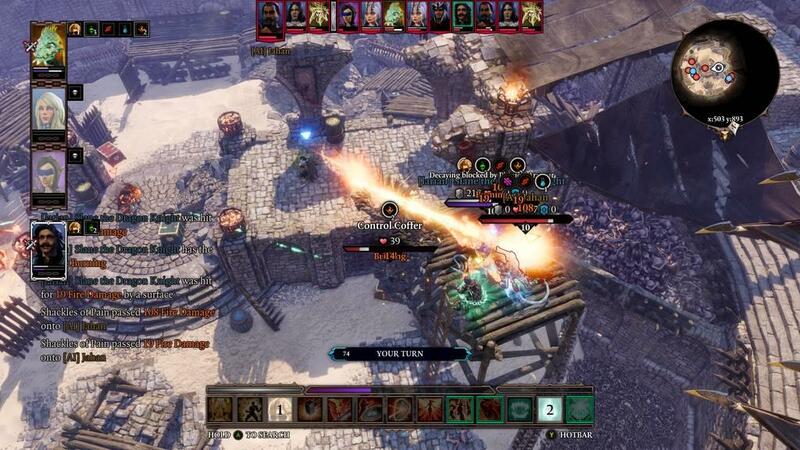 But Divinity: Original Sin 2 (along with its revamped self, the Definitive Edition) thinks it’s putting its best foot forward by making your first hours miserable. Yes, I can appreciate tough love. 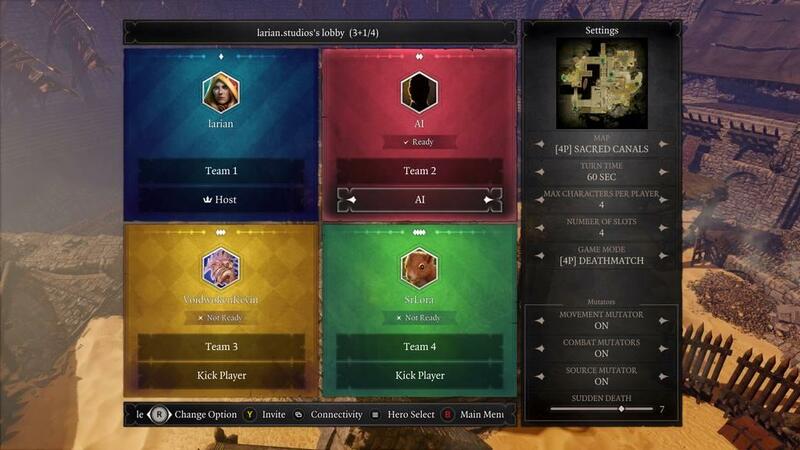 But Larian Studios built its game for tacticians with some previous experience, not for entry-level interns like me. Look, the game is huge. And I don’t mean the map. I mean the tactical layering. There’s a game of Rock, Paper, Scissors going on here that’s more like Rock, Paper, Scissors, Lightning, Poison, Steam Burns, Gale-Force Winds, and Die in a Fire. At the intended Classic difficulty level, me, a beginner, was getting racked by the enemies’ Acts of God while I was literally just tying sticks and stones together to make a hammer. Enough bellyaching, though. Once I’d taken the difficulty down a notch, then I was given the breathing room to learn the combat’s mind-boggling interweavings—the Rock, Paper, Scissors, etc. Many hours of gameplay later, I finally felt like I’d wrapped my head around the spiderweb of combat systems. I punched the difficulty back up to the default. Now I’m overpowered with skills, ability scores, weapons, armor and, most importantly, knowledge. Knowing, of course, is half the battle. 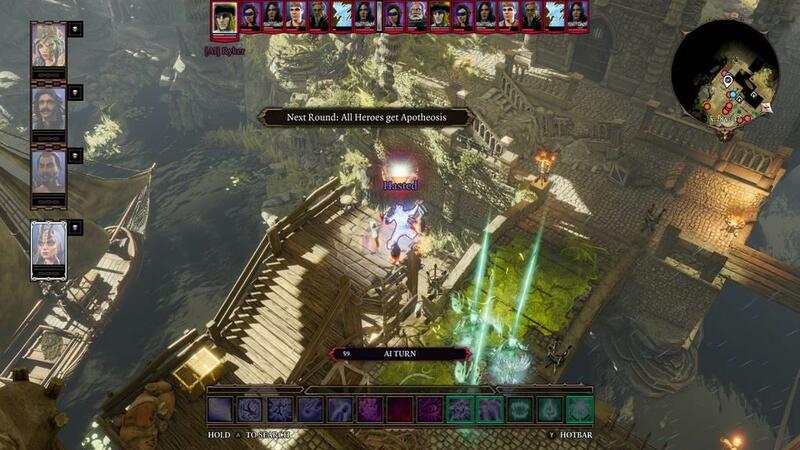 I have no doubt that Original Sin 2 will continue to challenge me in exciting, horrifying new ways. I’m confident, however, that I now have the smarts to take them on. But the difficulty spike in act 2 is impenetrable at first. Act 1 does nothing to prepare you for how often you’ll see the reload screen. It’s just death after excruciating death in an AI curb-stomping beat down. 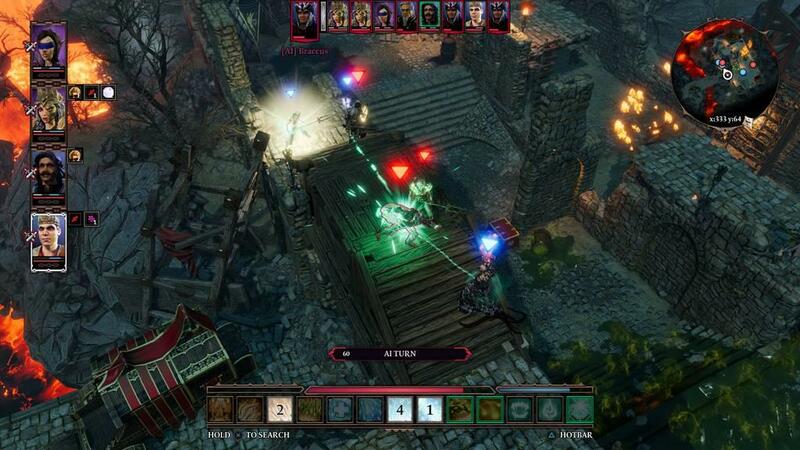 Original Sin 2 is a tactical role-playing game. One of the most complex I’ve ever seen; the XCOM of RPGs. From a bird’s eye view—a sensible angle for armchair tacticians—you assemble an up-to-four-person squad of fantasy characters to explore and exploit the richness and ridiculousness of Rivellon. You can go all lone wolf-style, if you want to. But your companions’ stories? You wouldn’t want to miss those. Save the solo run for after you’ve done the full-party thing. Rivellon is a very bad place. It’s almost always bright and sunny outside (at least around the location I’ve umaffectionately come to call “Fire Island”), but the handcrafted combat scenarios, combined with the morally confounding storylines, expose Rivellon's dark underbelly. It’s a situation where tiny points of light are overwhelmed by the dark. This is probably the most pen & pad RPG I’ve ever played on a console. There are enough stats to fill an L.A. phone book. There are menus under menus under more menus. Making any of this navigable on console is no small feat of engineering. The fact that I can smoothly and intuitively move through this many menus with a gamepad here in Original Sin 2 is a technical marvel. Gamepads aren’t meant to do this kind of thing very well, but it’s done well here. 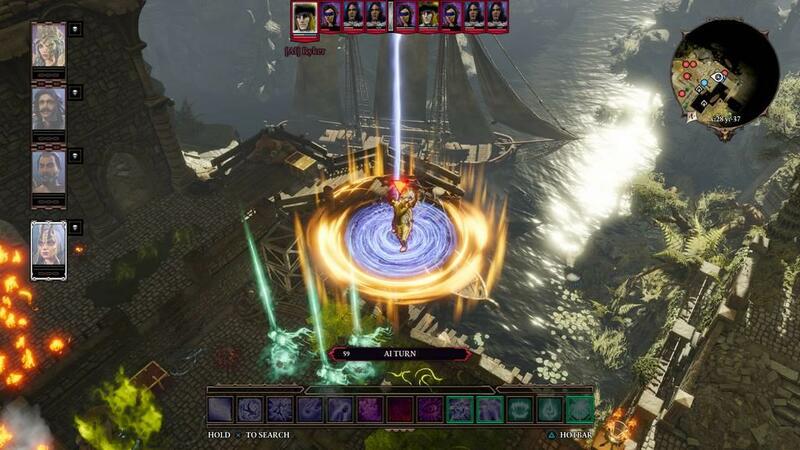 There are several quality-of-life differences between 2017’s Original Sin 2 and 2018’s Definitive Edition. Act 1 adds an extra lower deck to the opening act’s ship, in order to ease the angle of the game’s onramp. It holds your hand a bit more, and introduces you to combat and concepts in a less overwhelming manner. This bit is skippable if you want. You can head up to the original game’s normal starting position at any point. But like I said, little that happens in act 1 prepares you for the meat grinder in act 2. The warmth and uncertainty, as well as the pride and prejudice, of Divinity is all here. It sometimes comes off as an even snarkier Fable, minus all the farting and flirting. It’s a world of skeletons that tear the faces off people and wear them like masks so they can fit into polite society; a world of elves that lick your arm to learn about your vices, then eat corpses for the rest of the delicious story; where you can talk to cats and dogs (with the right perk) to round out this sordid tale. Welcome to Rivellon. It’s magical, it’s misshapen, it’s thoroughly dangerous and a lot of fun. If "fun" is the right word here. Everybody is convinced they’re the most important person around, and nothing is more important than whatever they’re doing right now. It’s equal parts charming and exhausting. It’s a world where you can’t hardly trust anyone, but is a lot more fun when you do, consequences be damned. “Now, shall we get on? There is rather a lot to see,” says Fane, one of the aforementioned face-ripping skeleton people. A lot to see. I’ve barely hit landfall and already the story spirals out in so many ways that I can see the clock stretching for a dozen hours in every direction. The non-player characters are a regular rogue’s gallery of Dickensian overactors. I say that affectionately. Every voiceover hams it up a little more than the last. This NPC is a sad clown. This one’s way too happy. Honorable-sounding bad guys. Despicable-sounding good guys. Everybody is so over-the-top that it’s the calm, cool, collected characters that make themselves suspect. I run across the occasional merchant, someone to sell goods to, of course. But when I open up my inventory, I’m struck with a familiar paralytic. Since I have no idea what’s useful and what’s junk, I can’t bring myself to sell anything. Can I craft something with this later? Will this be the key to unlocking a rare interaction with an NPC? Who knows. Can’t sell anything, I guess. Eventually more and more recipe books fall into my lap, and I'm whipping out fire arrows and resurrection scrolls in no time. Just keep an eye on each item’s value. I wouldn’t normally stow away a chicken’s foot, but it’s worth a small fortune to a new player, even though I’m all the way through act 2 and haven’t found a use for it yet. There are lots (tons!) of little things to learn about the combat. Some things makes sense. Some do not. Like the utter stickiness and pervasiveness of fire. Like carrying around a bucket of water with you for hours, but finding out that buckets of water won’t put out those flames. Like arrows that, Robin Hood-style, can wind their way through steel cages or sail completely through wagons, while my dragon’s breath is fully blocked by those same objects. You can drink an entire bottle of poison in the middle of a fight if you’re not careful (healing for undead, bad for everyone else). You can target your own team if you’re not paying attention. You can move when you want to attack and attack when you want to move if you click the wrong button. And spinning the screen for a better viewpoint sometimes makes your pointer fall off its target. It’s a land of bizarre micro-occurrences. A land where an affectionate dog named Buddy attacked me for trying to feed him a human leg. A land where a spaced-out cat followed me around harmlessly, until one trigger happy guard killed it without explanation—especially since no other guard seemed to have a problem with the cat. I'm not bitter, you are. The logbook is jam-packed with sidequest-itis. Can’t swing a dead cat (sorry, spaced-out kitty) without hitting another fetch quest for this person or other. Drawing a narrative throughline into all of this is sometimes a lost cause; better to just wander around and click on everybody and everything until a mission wraps up that way. In the beginning, I finished more missions on accident than on purpose. It makes the world sometimes feel random, and your place in it sometimes feels random as well. Give it time, however, and your importance in this world becomes apparent. 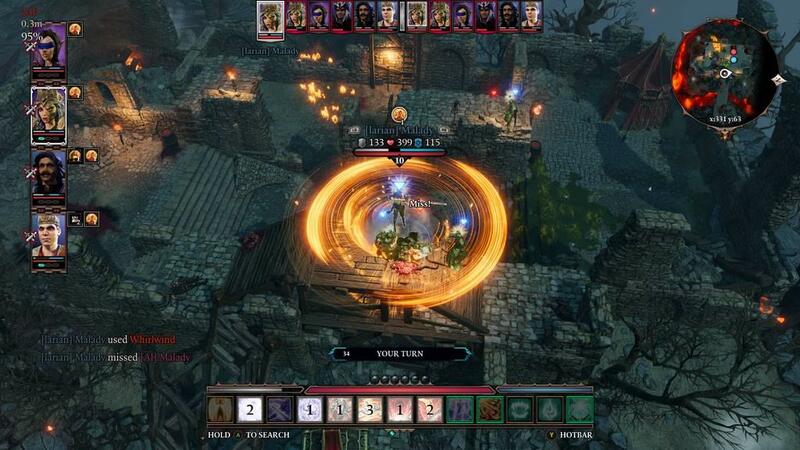 The loom that is Divinity: Original Sin 2 will eventually weave together a complicated narrative of religious and magical oppression, not-at-all-casual racism, and numerous other social injustices to plentiful to name. Many battles end up in a complete cluster. Enemies that you can’t target because they’re clipping through a door. Failing to inform me when an enemy will take an attack of opportunity when those times should be clearly marked. My dwarf unable to use his Polymorph skill of Raging Bull for, well, the only reason I could determine was that a brazier hanging high overhead was inexplicably blocking his path. My mage seemingly trapped against a wall and a Meat Golem, when my top-down perspective clearly showed 180-degrees of escape that should’ve been available. Enemies can fire arrows through seemingly impossible slots, but you can’t run over an empty sack to get to higher ground. Magical rain falling from above can be blocked because my line of sight is blocked by fence with very wide gaps. Showing my path was clear when it was in fact blocked. Saying my path was blocked when it was entirely clear. Not to mention the fact that my skeleton dude is, for all intents and purposes, disguised as a normal human being; yet the enemy always knows to throw a healing potion at him to hurt him (remember, poison heals the undead and healing potions hurt them in Divinity.) 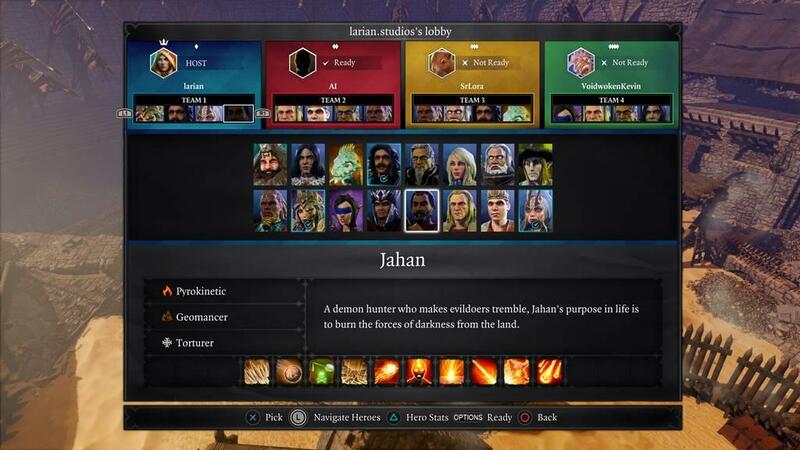 Larian Studios needs to send in the cleanup crew. There's still work to be done here. The difficulty level at first is one thing. The glitches and poor design choices are another. Both of those combine to make for a harrowing experience at first. But, like I’ve indicated, once you’ve learned them, you’ve learned them. They don’t make more sense in hour 100 than they did in hour one. But you’ve adapted through sheer necessity. Graphically, the world is a wonderland of ever-changing colors and textures. Yet it’s still somehow one of the least photogenic games I’ve come across in a while on console. Not that the world itself somehow isn’t pretty. But it just doesn’t screenshot well. Not at all. My armor kept getting cooler-looking. My weapons grew suitably more menacing. The environments felt full of detail at all times. But it still doesn’t smile pretty for the camera. Perhaps it's the overbearing UI, or the camera that's (rightly) more interested in crafting strategic combat angles than photo mode angles. Yet my sentiment still stands. Regardless, you’ve got a motley crew at your side. There are six potential party members, including yourself. But you can only run with four total characters at a time. You’ve got some difficult choices to make. 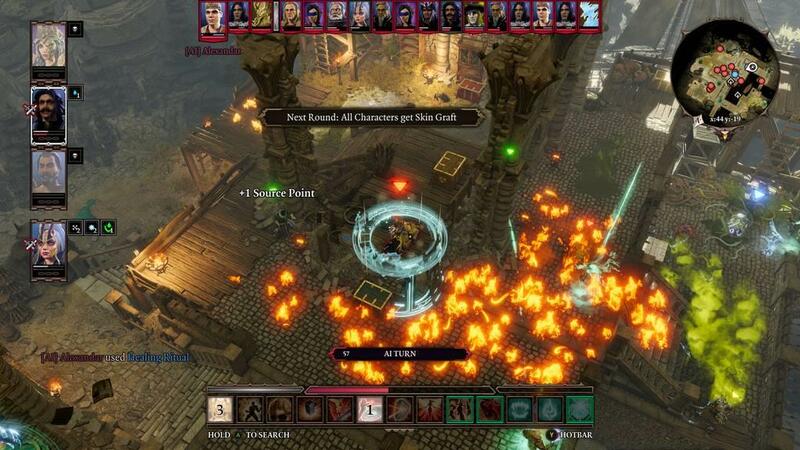 The only choice that isn’t difficult, at least on “Fire Island,” is to have Lohse the enchanter in your party. Unless you find the occasional water balloon, she’s largely your only source of rainwater during battles. And without rain, you’ll likely just be on fire. All the time. There are, without a doubt, times in battle when this game is astounding. When the rain is streaking in diagonally, and elemental lights are swarming around characters, and the ground is pounded and cracked, and half the screen is drenched in fire and poisonous gas clouds, and other powers are raining down from the clouds...then this not-so-photogenic game becomes breathtaking. It saturates the senses. It overwhelms. And trust me, you haven’t lived until you’ve bull rushed a decomposing swashbuckler that you polymorphed into a chicken last round. Congratulations to the composer for crafting the most magical soundtrack I’ve heard since Fable. The plunking strings, sparse flutes, and gentle, ringing percussion is the stuff of fairy tales. It even wanders into medieval pop, if there is such a genre. Like Ed Sheeran’s “I See Fire” at the end of The Hobbit credits. It lends a contemporary flair where it’s unexpected but entirely welcome. I had nothing but misgivings at first. 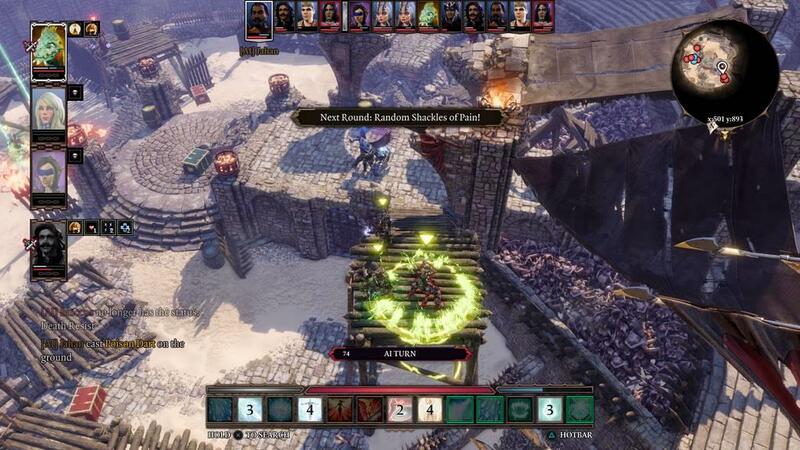 When I introduced myself to Divinity: Original Sin 2, it gave me nothing but the cold shoulder. More recently we’ve come to an uneasy truce. We’re not friends yet, but I’m already starting to remember our time together fondly. 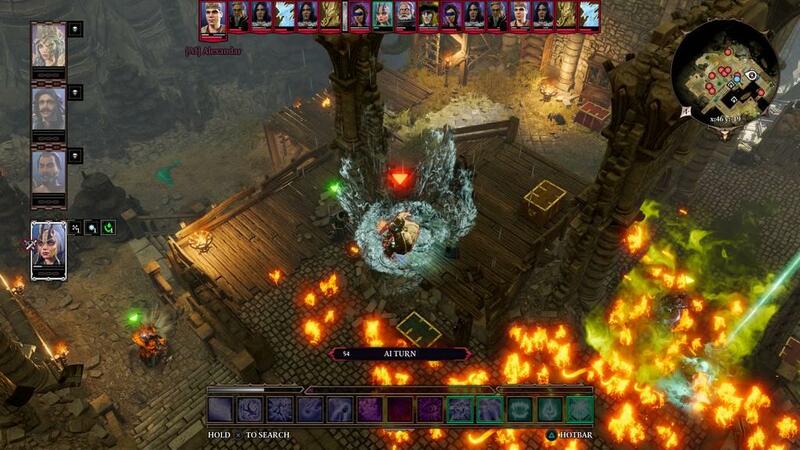 The Definitive Edition inserts a bunch of quality-of-life improvements to gameplay and the interface, all of which are welcome, but the game's bones are completely recognizable. 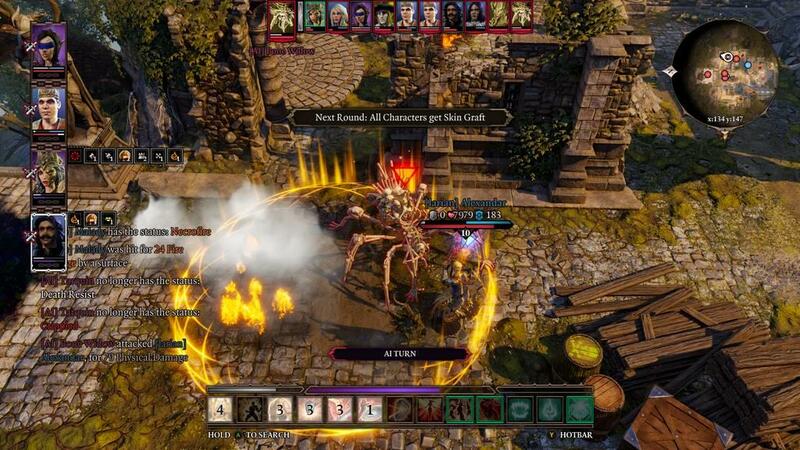 If Larian Studios cleans up the bugs and the most egregious of their design choices, then Divinity: Original Sin 2 on console may start to live up to its big brother version on PC. 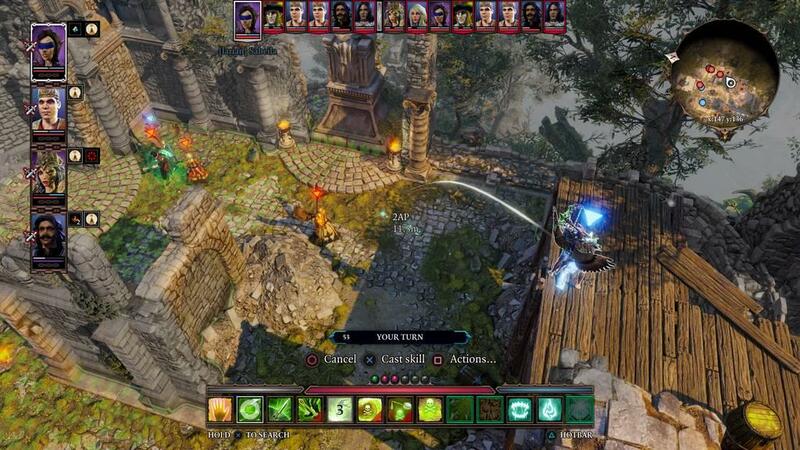 Original Sin 2 shakes your hand a little too hard when you first meet. It needs to relax until you get to know it better. It's endlessly surprising, with characters that lose their stiffness over time, in dialogues and battle logs that piece together a dangerous, thoughtful world. It's tough. But the reward is that you get tougher, too. It still needs to clean up some of its tactical sloppiness, though. Having a ton of options in battle is only good if its rules are fair and make sense. Randy gravitates toward anything open world, open ended, or open to interpretation. He prefers strategy over shooting, introspection over action, and stealth and survival over looting and grinding. He's been a gamer since 1982 and writing critically about video games for over 15 years. A few of his favorites are Skyrim, Elite Dangerous, and Red Dead Redemption. He lives with his wife and daughter in Oregon.